Possibly the biggest challenge to living within a cylindrical habitat with five other people is adjusting to the fact that outside is considered hostile. There are no leisurely walks, no strolls through the park, and no lying in grass watching clouds drift by. To speak of it, there’s no grass to speak of! Aside from EVAs, which are more work-oriented than anything else, and engineering rounds (same thing), there isn’t any opportunity to get out of the Hab for any extended period of time. 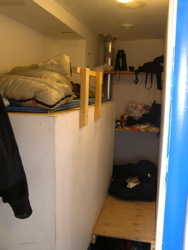 So, we’ve gotten used to these surroundings in the few days that we’ve been here, especially the upper deck of the Hab. This is where most of the work gets done: filing reports at the end of each day, planning EVAs, cooking, eating, relaxing, and bonding as a team. The space is very multi-purpose, with the main central table serving as both a kitchen table and a workstation (or game table), the kitchen sitting right next to the main workbench, and it allows access to every other part of the Hab. 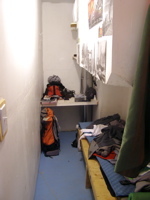 Our day, however, begins in the state rooms, each of which is composed of nothing more than a bunk and a small desk (and a few have installed shelving). For most of us, these state rooms are just for sleeping and storing anything we can’t leave out in the main room, although Brian and Carla do complete quite a bit of work in their larger rooms as benefit to being our Commander and XO, respectively. While my state room, pictured to the right, is quite messy, it’s more to allow access to anything I may need immediately, hence the spread of supplies on my desk. Since we are in sim, the only time we can leave the Hab (aside from engineering rounds, which I’ll get too later) is while on EVA, or Extra-Vehicular Activity; those trips start in the EVA Prep Room, pictured to the right. Here is where we store everything that is needed for an EVA, at least everything that can be carried that isn’t specifically engineering related. During the suit-up procedure, the Marsonauts first put on their flight suits (hanging in the background). When we first arrived at MDRS, we tried on the suits until we found one that would fit, then Velcro-ed our mission patch and name tags onto our selected flight suits. They then don their boots and waders, along with their radios and headsets. At this point, their is usually also a com check between the Marsonauts and HabCom (the person who stays behind to communicate with those on the surface) before the suit-up procedure progresses. 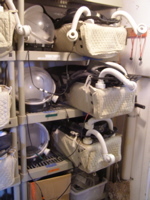 Once everything checks out, they then strap into their PLSS (Portable Life Support System), usually with the help of someone in the ready room. 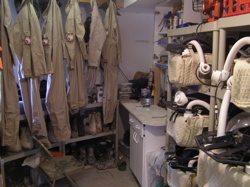 This backpack allows the EVA personnel to survive outside of the Hab as it filters and transfers breathable air to the helmet, which is put on next. A final check is made before the Marsonauts enter the airlock, where they must wait for five minutes for depressurization, before leaving the Hab and stepping out onto the surface. Once they return, this process is repeated in reverse, usually followed by a hot meal for the returning explorers. 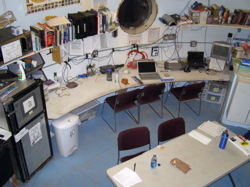 During the day, a lot of the work is completed in the lower deck, which includes the EVA Prep Room, main airlock, Biology and Geology labs, engineering bay and airlock, as well as the bathroom and shower. 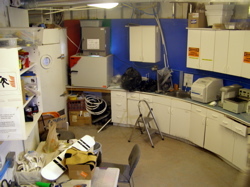 Since our completed EVAs (four in total) haven’t been centered on either Biology and Geology, the main lab area (pictured) has mostly just been inventoried and cleaned by Luís, our Biologist. There is an EVA out currently that focuses on geology and geophysics, plus there is a planned EVA later today centered on biology, so this area will mostly likely being in use more for the rest of the mission. Darrel, our Engineer, is also using the area as an interior engineering bay and repair station for basically the entire Hab. Speaking of engineering, the Hab also requires a power supply separate from the Hab and its vicinity. 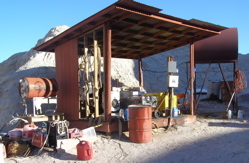 In a future Martian habitat, this power station will be much more than a diesel engine, so it needs to be separated from the Hab for the safety of the astronauts. During engineering rounds, Darrel and usually one other member of the crew (recently it has been either Kiri or Carla) check the power supply, batteries, ATVs, general Hab upkeep, Green Hab (which is both a greenhouse and a water recycling facility), and the various systems that are required in order to keep everything running smoothly. During a typical day, rounds are made in the morning (following the meeting) and at night before our mission support window opens at 2000 Local Time. This gives the engineer enough time to make the measurements and other checks, fix anything that needs fixing, and file a report so that (for any major problems), Mission Support can help troubleshoot things. Once everyone is inside, the ATVs are shut down, the final rounds are made, and reports are filed, the rest of the day/night is for us. Usually that consists of preliminary planning sessions for the next day, eating the rest of the prepared dinner, and completing anything that couldn’t be completed during the day. Combusting cakes usually aren’t on the agenda, or if they were I wouldn’t know about them prior to, right? All in all, just another day on Mars. Posted in: Crew health, EVA, Maintenance, Research. These are great articles! Thanks for providing so many details, this is just fascinating. Do you do the outside engineering checks without the EVA suits? If so, how come? What sort of biology tests do you do? The ability for the environment to sustain life, or actual life that may be native there? These are great pics of the hab. I notice you have the upper bunk. I would really like to see one of the staterooms with the lower bunk for comparison. The engineering checks are performed without suits for a number of reasons. Each EVA needs at least two people (buddy system), requires five minutes of depressurization/repressurization at the beginning and end, plus makes things harder to access and read. We still do the engineering checks “in sim” as the Hab is surrounded by a number of pressurized tunnels (either denoted by PVC enclosures or rock lines) that allow the engineers to be in sim while still performing their duties. As for biology, a little bit of both…? I’ll take a picture of a lower bunk state room and edit it in right quick! EDIT: You should see two state room images above. I took a picture of the counterpart state room of mine, so those two really do slot together! In a nutshell, I will be collecting samples from putative extreme environments and will try to culture them with various “extreme” culture media and try to categorize them. Thanks guys! I appreciate all the responses. For some reason I can’t see the lower bunk picture, but now I’m afraid to ask to see Luis’s room. What’s an extreme culture environment? Kiri’s tofu stir fry? Ah, I can definitely see the other picture now, and I like how it shows how they slot together. Tiny, but I bet the privacy is nice. When I volunteer (I WISH!) I’ll request a bottom bunk, because for some reason it looks like it’d feel a little more spacious, for no particular reason.